The panel discussion entitled “Corporate Social Responsibility as a Roadmap to Social Sustainability in the Horticulture Sector” reflected on the practices and challenges of doing responsible business in the horticulture sector. A healthy horticulture sector is a socially responsible sector in which companies throughout the horticulture cluster balance social, ecological and economic considerations. 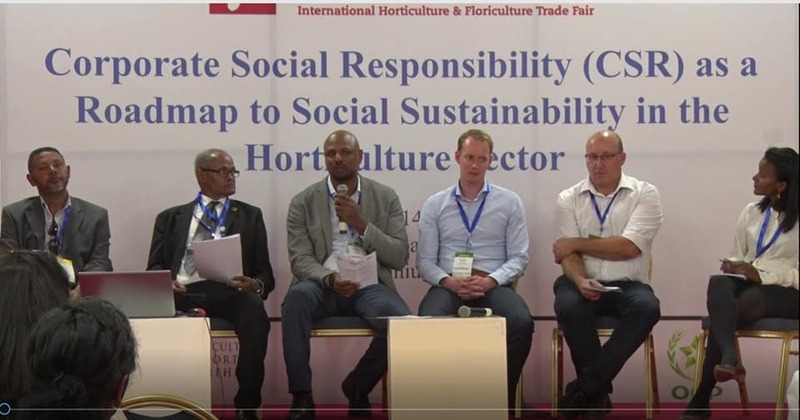 The concept and practice of corporate social responsibility in the horticulture sector was convened in a panel discussion which was held as part of the HortiFlora Expo on Thursday March 14, 2019 at Millennium Hall, Addis Ababa. This panel, chaired by Yassin Legesse, EHPEA board member, brought together both local and foreign experts. Yassin underlined corporate social responsibility is no more an option but mandatory in the Ethiopian market. He added companies need to incorporate CSR in their overall company strategies and objectives. According to participants, the concept of CSR is often neglected or underestimated in Ethiopia. Hence, continuous discussions and dialogue need to be organized.